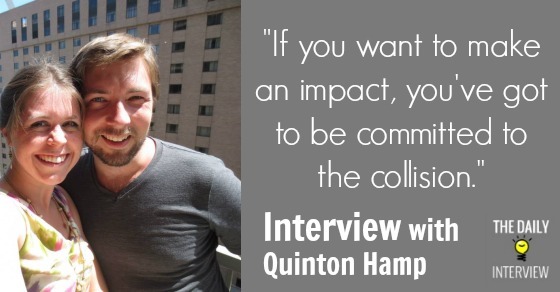 I like Quinton Hamp because he’s just a regular guy who figured out what works, and keeps scaling it, building on his successes. He makes his money through affiliate income, across several niche sites and other internet properties that he owns. Quinton made his way onto my radar when he went from making only $600 or so in a month at the beginning of 2013, to over $10,000 in December 2013. That kind of growth doesn’t go unnoticed! If he keeps up his current pace, he will definitely hit the often-desired “six-figure” mark, and it’s well deserved. In this interview, Quinton talks a lot about some of the reasons for his success. I think there’s something you can learn from him. Quinton, while I know you don’t consider yourself to be a “make money online” blogger, it’s been really interesting to follow your journey at your blog The LostCyclist. Tell us a bit about yourself, your journey, and your business – What did you used to do before you were earning a living online, and when did you make the transition? What exactly do you do to earn an income online? I’m glad to see you pick up on the fact that I’m not a “Make Money Online” guy. For awhile I wasn’t sure if I wanted to be a “make money online blogger” or not. The commissions are so good in the MMO niche that I think all of us want to try our hand at it. When I was 16, I started playing with HTML. I built a couple of sites and sold stuff through them and through eBay. When I turned 18, I did eBay full-time and it gave me enough money to support myself while living at home. Later, Tim Ferris’ book, ‘The 4-Hour Work Week” further fanned the flame towards passive income. After I graduated college, I found myself sitting around the house, bored. So I started looking at ways to make a passive income. That was about 10 days after Pat Flynn started his first niche site challenge with Security Guard Headquarters, and it inspired me to build my own site. That first $100 Adsense check pretty much sealed the deal for me. It’s been a long 3 years with “Penguin” and “Panda” (the names of a couple Google search engine “algorithm changes”), but I finally figured out the strength of using private blogs to promote my review — or “money” — blogs (and, at the time, Squidoo lenses) and started hitting some $1,000 months pretty consistently. After getting passed over for a promotion at my call center job, I decided my “real” career had reached its peak and it was time to try turning my hobby into career, so I resigned. I came home and started writing like a fiend. Most of what I do is creating reviews from products on Commission Junction, Shareasale and Amazon. Putting my back against the wall was the best thing I could have done. I think the coolest success was hitting just over $9,000 gross this January. I made more in December of 2013, but we would almost expect that, considering the Christmas holiday. January, however, has been really neat as one of my bigger blogs picked up some natural links from related bloggers. So it now has a more diversified traffic stream, plus its traffic from the search engines has increased. And, it’s personal validation that I built a helpful blog. Altogether, I only saw about 45,000 visitors last month across all of my channels, but I see this “game” as a matter of just getting enough content up that you can walk away from each project and let it do its “thang” while you work on something new. That’s awesome. It’s great to see success like that, especially when you can tell you’re actually benefiting others too. What are your plans (if any) to diversify your income sources a bit more? I was just working on my diversification plan tonight, actually. My first goal is to dramatically scale up the niche sites. I feel like I finally have a good system, and so it is key to get that automated and outsourced as soon as possible. From there, I am revisiting e-commerce, and hope to master it, and create a scalable system for starting multiple drop shipping sites. I realize these sites still rely heavily on Google, but they do have the “buffer” of being allowed to use other traffic streams, namely pay per click advertising. Plus, we’ve seen in the past that if Google decides to punish niche sites, they tend to favor e-commerce, so it seems like a reasonable “hedge”. I’m also starting to study both the stock market and real estate, reading about a book a week (this week it is “What I Learned Losing A Million Dollars” by Jim Paul). I’d like to move money into the “real world” in the next couple of years, for even more diversification. Studying these subjects is giving me a deeper understanding about how to increase the financial valuation of my business and how to strengthen the business against economic swings. I’m sure your online endeavors didn’t always bring good results – what would you say you’ve struggled with the most on your journey, and how did you overcome it? The Google updates have been a bear. After “Penguin” in April, 2012, I quit working on my sites and spent the summer camping, canoeing, and just generally having a good time while the sites slowly sank into oblivion. That August, I ran across Skeffling (http://skefflingsmakemoneyonline.com/) in the Infobarrel forums who was having really good success with Squidoo. The Squidoo game was short-lived, but it gave me the momentum to start out-running the Google updates. I’m also part of The Pond, which is a private IM forum. It’s a great way for me to keep a finger on the pulse of the industry and see what tidbits the SEOs there are sharing. I know your greatest source of income right now comes from your work as an Amazon affiliate. What are some of the reasons you think you’ve been so successful with Amazon? Are there some tips or “golden nuggets” of information you can share for people who might be struggling to make money as an Amazon affiliate? You want gold, do you? Ok, here it is. I start off my posts with about a 200-word introduction. I try to use Google Suggest to grab related keywords that maybe consumers want to know about before buying and work some of those in. Then, I choose 3-5 items and devote 300-500 words per each item. Finally, I add as many paragraphs as necessary at the end to answer any other long-tail queries I pulled out of Google Suggest. It’s intensive, and most pages on my site take 1.5-3 hours to build. But it does help me rank for more long-tail terms. For someone who is just starting out trying to build an income online with affiliate sites, what advice would you offer? What do you wish someone told you about when you first started? I hate plugging this guy carte blanche, because he does like selling crappy items to newbs… That said, Becker’s Infinitum course over at Source-wave really turned my game around. He has a super positive attitude towards SEO, and it was during his teaching that everything “clicked.” I wish I had found him sooner. Making money online is a journey. Your first idea won’t work, but it will lead you to your second, and your third. The seventh idea will have mediocre success, but the eighth will be a total flop. Take notes along the way, and by the time you’ve failed a dozen different ways, you will see all of the little areas where you’ve succeeded and then you can combine those wins into a project (lucky number thirteen!) that will blow you away. Secondly, start by finding a winner and copying them. Not their niches, but their techniques. Then, after you’ve won for awhile, you’ll be able to figure out how to bring the WOW factor and still win. Too many people have ideas that make you tingle, but don’t have the basics down to make them a success. Finally, make sure you learn your business before you quit your day job. Nothing wrong with being a “Chickenpreneur” where you work while learn your business (too “chicken” to go full time, get it?) You can’t focus on learning your business when you have collectors breathing down your neck, and the SEO game is a slow one to pick up steam. Let’s take a step back and look more generally at making a living online: If you had to take your best advice and put it into one sentence or phrase, what would that be? I also use Long Tail Pro and this Google Suggest scraper called Fresh Key on a daily basis for my keyword research. One last super-pertinent question: What are you going to do with Twins in the house? I dunno man. Change a lot of poopy diapers, I guess. They’ll be here at the end of April, so I’m hoping I can take a little break from writing content to hang out with them. I’m revamping my blog to be more about my life and less about Internet Marketing. I’ll still share important IM discoveries, but I’m stopping with the income reports and am going to start discussing stuff like soldering and learning to program in Ruby. You can find it at lostcyclist.me. Thanks a lot for sharing your experiences here, Quinton! As always, I’d love to hear what you thought about this interview in the comments. Quinton, thanks for sharing your awesome successful stories. $9K in Jan is amazing. I also got Penguin hit in May 2012 and took a break. I stumbled upon Skeffling in 2012 and was going into Squidoo, but didn’t take serious enough action. I heard they also hit and closed down many posts. I truly admire your persistence and it’s way to go. Good luck with your Real Estate Investment, it’s way to go, as you are buying “real” assets. This IM and traffic goes up and down and drives me crazy sometimes. Thanks for the comment Kent! This was very encouraging – thanks for sharing so much! I was really getting into Squidoo before everything went south, now I’m just making around $80/month on there and they have deleted several of my articles. Are you in Missouri? I ask because Amazon shut down my affiliate account because of some new laws and it has really hurt not being an amazon affiliate…..do you have any other affiliate recommendations? I am using skimlinks right now but not real impressed. Thanks for the comment, Phallin. 🙂 It sounds like a lot of people experienced the same downturn on Squidoo (myself included). For Amazon, there are ways around the issue of not being able to be an affiliate in your state. If you have a friend or family member in a state where they DO allow affiliates, I know you can change your address to your friend/family member’s, and stay as an affiliate. Just be aware that tax forms, etc. will be mailed to that address. Eric sums it up pretty well. I know some IM’ers have simply opened a box at a UPS store in a non-NEXUS state, and it has worked well for them. Some will create an out-of-state LLC. Wow. Quinton has come a loooooong way from the Niche Rivalry days. Good on you for finding what works and scaling it up. I stopped visiting lostcyclist.me when you stopped posting for a bit. Well done on getting back in the game and crushing it! Keep the stellar interviews coming, Eric. I enjoy reading them. Thanks Ollie! Really glad to hear you’re enjoying the interviews. Yes, Quinton has come a long way, and I hope (and believe) he can keep it up. Great story. I got hit by the Penguin/Panda axis of evil too but I dropped out after that. But I’m giving it another shot and Quinton’s tips over at the Pond and on his blog has been really helpful. Magnificent problems in this article. I’m quite delighted to talk to your document. Thank you a lot and I am having a look in front to the touch a person. Are you going to be sure to drop us a e-mail?